That's it. Watford have won their first league match of the season - and scored their first home goal in the league. The town centre will be wild tonight - although it is most Saturday nights to be fair. Watford's Steven Berghuis has two shots saved by Heurelho Gomes after the home side break, and then at the other end Federico Fernandez heads well wide with a free header from six yards out. Oh Federico! Watford fans have just seen the 'added time' board. They are not happy. Fact. He's had quite a second half has Etienne Capoue. The ex-Tottenham man breaks away from his marker, 50 yards from goal, gets to the edge of the area, but fails to find team-mate Steven Berghuis who was in that part of the pitch commonly known as 'acres of space'. It's Watford again on the attack. Etienne Capoue tries another angled shot that is saved low by Lukasz Fabianski. Swansea are on the attack - desperately seeking an equaliser. Ki Sung-yueng, Jefferson Montero and Eder are on. Manager Garry Monk wants something from this. Despite being a man down, Watford are back on the attack. Jurado sees his effort blocked inside the area and then Etienne Capoue fires his angled shot wide. A long punt by Heurelho Gomes, a knockdown by Troy Deeney and a finish by Odion Ighalo makes for a simple but beautiful goal in graphical form for Watford. The question-mark shows that the Swansea player who conceded the initial free-kick is unknown, although it could also ask where the Welsh side's defence went. "Your team is a goal up, comfortable in the game, and then Valon Behrami does something idiotic. He stamped on him, he meant it, it's a red card and the referee had no choice, Idiotic." Ah the twists of football. Valon Behrami is sent off for pretty much a studs-on-leg challenge on Andre Ayew. It looked six of one at first, but the replay showed that the Swiss player was a little bit naughty. "Ashley Williams should clear the ball but at the same time it's good play from Troy Deeney and Odion Ighalo. They linked up so well in the Championship and are doing it again. Watford have been the better side today and deserve their lead." "A ball straight through and a good finish from Odion Igahlo, but Swansea should be able to defend that." He went close moments earlier and now he's scored -Odion Ighalo nets Watford's first Premier League goal at home this season. A long punt into the area is nodded into the path of Ighalo by Troy Deeney. The Nigerian, who joined from Udinese in 2014, slams in from eight yards. Hornets fans are buzzing. Sorry! Odion Ighalo goes close. The strong attacking Watford player brushes off his defender to fire wide from six yards. Remember Watford have yet to score at home this season - this is their third attempt. The small consolation is that their opponents have failed to score at Vicarage Road too. The latest effort to end that barren run falls to Almen Abdi, but his tame shot fails to trouble Lukasz Fabianski. Swansea have another corner but Jonjo Shelvey - the darling of English football... against San Marino - scuffs his kicks. Well that was interesting. Swansea's Neil Taylor plays in a low swinging ball from the right that Sebastian Prodl mis-kicks for a corner. The set-piece comes to nothing. The players are back out on the pitch. Is a draw the likely outcome? #bbcfootball, text 81111 or go to the BBC Match of the Day Facebook page. For all of you gagging to hear who the fastest player on the pitch is... it's Watford's Allan Nyom aka Nyom who has hit 34.32kph! It's been simmering, but that's all, just simmering. The best effort of the match is ruled offside - an acrobatic volley from Bafetimbi Gomis that is punched away by Heurelho Gomes. "Swansea have created the opportunities in this game so far - nothing really from Watford." Watford's Odion Ighalo drives into the area from the left and strikes a low angled shot that is easily kept out by Lukasz Fabianski at the near post. Bafetimbi Gomis gets a shot away while on the ground, from Andre Ayew's square ball, and then protests he was brought down. The shot is saved and the French striker has his penalty appeal waved away. Could someone put the kettle on please? Two heaped teaspoons of coffee for me. Watford are mainly attacking down the left so far, through Ikechi Anya and Jurado, but the Hornets are still waiting for their first attempt on target. Swansea's Bafetimbi Gomis might just win the 'Most Offsides' award. The French striker drifts a yard off again. Bafetimbi's note to self: "Do not stray"
There is not a lot happening. Swansea are stroking the ball about - 15 minutes until the break. The Hornets are without a win in their last four league meetings with Swansea (D2 L2). Troy Deeney goes agonisingly close to breaking his Premier League duck for Watford - his low effort cuts daisies along the way to drifting past Lukasz Fabianski's left-hand upright. The former Tottenham stopper dives low to his left to keeper out Bafetimbi Gomis's turn and shot from 20 yards. Oh so close for Watford! Almen Abdi drives an effort from 20 yards that sails a yard wide of the Swans goal via a Neil Taylor deflection. Moments earlier, Troy Deeney, yet to score in the league for the Hornets, saw his effort inside the area blocked by Ashley Williams. Temperatures raised inside the Vicarage. Jonjo Shelvey, arriving on the back of his England double date, tries to play in the potent Bafetimbi Gomis, but his pass is overhit, very overhit. The Swans have not settled yet. Effort on goal by Watford. The ball is played in to the area from the left and knocked out to the feet of Sebastian Prodl on the edge of the box. The Austrian defender, no doubt happy his country have qualified for Euro 2016, smashes his drive two feet over the bar. It's all rather sedate at Vicarage Road. Odion Ighalo has been fouled by Federico Fernandez - a free-kick to the home side about 50 yards from goal on the left. "Ayew wants to get involved in everything"
"Andre Ayew is exciting and scores goals. His goals are all about getting to that far post, which shows desire and athleticism and wanting to get onto the end of the ball when it's played into the box. "He wants to get involved in everything, and he deserves everything he gets because he's working so hard." Ayew, who's scored three goals so far this season, has had a quiet start so far. An early heart-stopping moment for Swans keeper Lukasz Fabianski who makes hasty clearance from a back pass from Kyle Naughton, with Odion Ighalo hurtling towards him. Watford manager Quique Sanchez Flores and Swansea boss Garry Monk shake hands. They are both wearing knitwear. We are under way here. "As no top-division team was more active in the transfer window than Watford, this weekend's match will be viewed as an early opportunity to test how successful their business has been. "As well as the 15 new players recruited, it has also seen the departures of several key players who helped them secure promotion, with the likes of Gabriele Angella, Fernando Forrestieri, Miguel Layun and Matej Vydra allowed to leave. "The hosts haven't scored since the opening day and are winless this campaign, so the visit of a much more settled, self-assured and unbeaten Swansea will rightly be viewed with a degree of trepidation." Hey Watford fans. You guys could go above Chelsea with a draw. Now wouldn't that bring a smile to your faces? The teams have come out on to the pitch. Watford's net spend of £34.3m was the fifth highest of all the clubs in the Premier League. Italian owner Gino Pozzoallowed manager Quique Sanchez Flores to bring in 15 players to the newly promoted side. How quickly will they all knit together? However, a key signing could be defender Nathan Ake who arrived on loan from Chelsea. He's a player I've seen a few times, and he's impressed me with his unflustered play. Let's see if he gets many chances during his spell. It looks a lovely day down in Hertfordshire. If you have any photos you have taken outside the ol' Vicarage then post them at #bbcfootball and we'll try to use a few right here... in this live text. Swansea fans know their stuff. They currently sit top of our predictions leaderboard, while Watford's supporters are the eighth most knowledgeable - so far. You can help your club move up our leaderboard - or stay at the top - by playing our Premier League Predictor game here. One change for Watford with Ikechi Anya coming in for Jose Holebas at left-back. 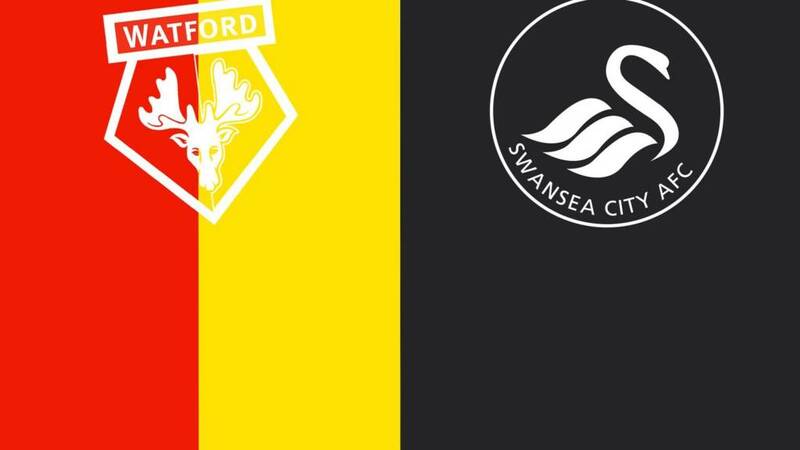 Watford: Gomes, Nyom, Prodl, Cathcart, Anya, Capoue, Behrami, Abdi, Ighalo, Jurado, Deeney. Subs: Ibarbo, Berghuis, Watson, Holebas, Diamanti, Dyer, Arlauskis. Swansea manager Garry Monk names an unchanged XI from the one that defeated Newcastle 2-0 last time out. Swansea: Fabianski, Naughton, Fernandez, Williams, Taylor, Shelvey, Cork, Ayew, Sigurdsson, Routledge, Gomis. Subs: Ki, Emnes, Nordfeldt, Eder, Montero, Rangel, Bartley. Apparently they're all singing "Garry Monk's Army! Garry Monk's Army!" in south Wales. Not that the 36-year-old Bedford-born Swansea manager is one who feels he needs to rabble rouse. Monk, with little fuss, has put together an attractive, attack-minded team who have quietly risen to the heady heights of fourth. Today his side face Watford aka "Hey! Big spenders" [explanation in a bit] who have three points from four games. Worth noting that the Hornets have not lost since then first day. Will it be Quique time today?